People participating in a Quest in Port Orford. | Photo by Cait Goodwin. Quests are fun, free-choice learning adventures that use clues and hints to encourage participants to discover the natural, cultural and historical "treasures" of place and community. Suitable for groups of all ages, self-guided Quests allow lifelong learners to explore parks, trails and other outdoor spaces in new ways and at their own pace. Quests are all made by people in the community, such as educators, rangers, or youth groups. They are created with permission of the land owner where the Quest is located. All the Quests are educational in nature, which make it different from Geocaching or Letterboxing. The clues are found in the award-winning Oregon Coast Quests guidebook, available at bookstores around the region. At the end of each self-guided interpretive Quest, participants find a hidden Quest box containing a log-book to sign and a hand-carved stamp to mark their accomplishment. The true "treasure" is the fun of the walk and learning about special places in the community. The current book contains 24 Quests located in Lincoln, Coos, Curry, Clatsop and Benton counties. Quests are great fun for families and school groups - and once you've gone questing, your group may even want to help create a new Quest for the next edition of the guide book! Before you head out, check the Updates page. The current Quest Book, 2017-18 Edition costs $10 and contains directions for 24 clue-directed hunts in five Oregon counties, including three brand-new Quests and one Quest that is in both English and Spanish. Visit the booksellers page for a list of retailers that sell Quest Books. If you are a bookseller who would like to carry the Quests book, contact [email protected] for more information! You can earn a Quest Patch! If you've successfully completed 10 or more Quests, you are eligible to receive an Oregon Coast Quests embroidered patch. The attractive patch is embroidered in shades of blue, green and grey, and it looks terrific on a backpack or jacket. Be the first in your neighborhood to get one! To request a patch, fill out the Request Form and send it in with a photocopy of your stamp pages. It's ok if your stamp collection spans more than one year or Quest Book. Find the Request Form at the back of your Oregon Coast Quests Book, or download it here [PDF]. The Greater Newport Chamber of Commeerce and Oregon Sea Grant supported the production of the Quests Patch. You may be asking yourself, where exactly did Questing come from? Questing was born out of a popular, 150-year old British pastime called letterboxing, which has grown to include thousands of boxes hidden in locations of natural or cultural signficance. In Vermont in the early 1990s, an organization called Vital Communities came up with the award-winning Valley Quest program, which uses paper-and-pencil hunts to encourage people to follow outdoor clues and learn about their region. Our Oregon Coast Quests are among many across the country modeled on the Vermont program, and our Quests program is the first and only such program in the Pacific Northwest. 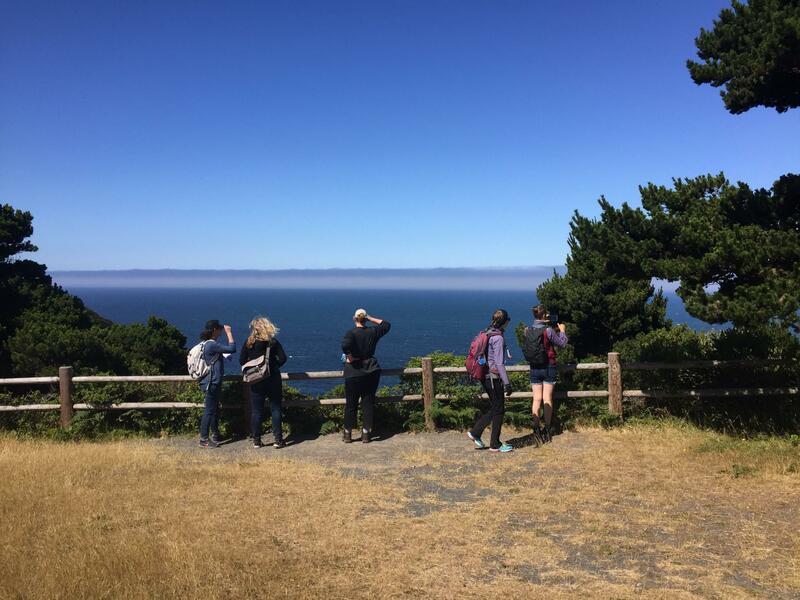 Teachers conducting the Port Orford Heads State Park Quest in 2017. | Photo by Cait Goodwin.